Democrat Ralph Northam KKK, Blackface Yearbook Photos EXPOSED! 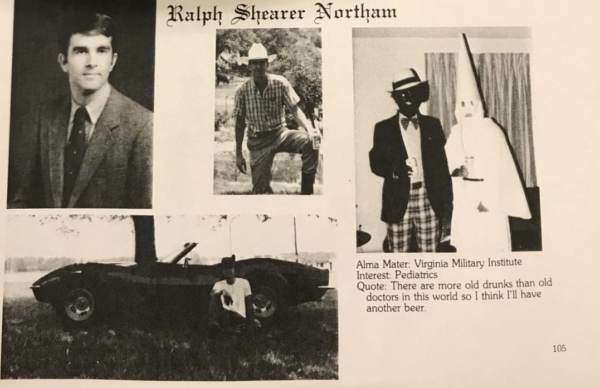 A picture from Democrat Virginia Governor Ralph Northam’s medical school yearbook from 1984 surfaced on Friday showing two men, one in a KKK hood and robe and one in ‘blackface’ on the same page as Northam. The photo was first published by Big League Politics on Friday and later confirmed by other outlets such as WaPo and The Virginian Pilot. Eastern Virginia Medical School allowed students to personally choose photos for their yearbook page, so Ralph Northam chose to put the racist photo of himself in the yearbook. Although Ralph Northam admitted to being in the racist photo, he did not reveal if he was the one dressed in blackface or the KKK robe. As expected, Virginia Democrat leadership is already defending Ralph Notham’s racist yearbook photo. Republicans, however, are calling on Governor Northam to step down. Friday afternoon, Governor Northam released a statement apologizing for the yearbook photo — but he refuses to resign. “Earlier today, a website published a photograph of me from my 1984 medical school yearbook in a costume that is clearly racist and offensive,” Northam said. “This behavior is not in keeping with who I am today and the values I have fought for throughout my career in the military, in medicine, and in public service. But, I want to be clear, I understand how this decision shakes Virginians’ faith in that commitment,” Northam continued.